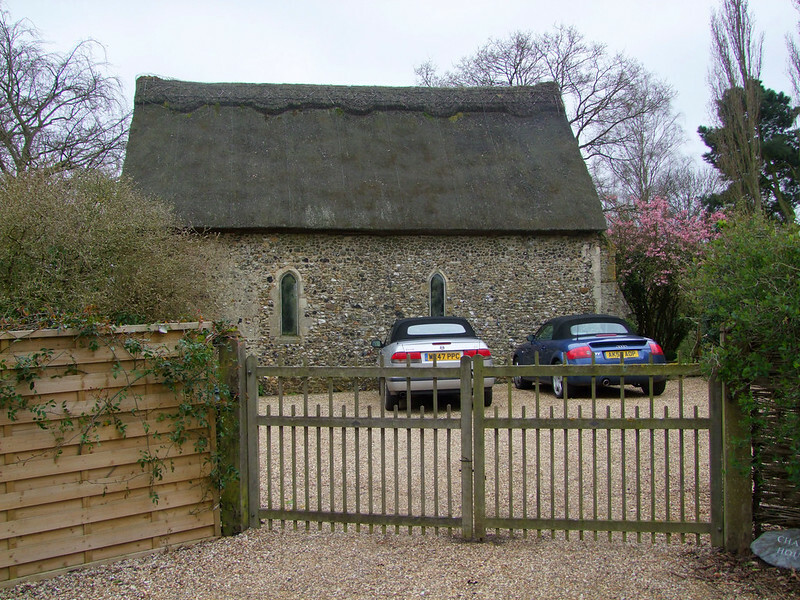 .Lindsey is one of Suffolk's small, pretty and remote villages, and its parish church of St Peter is a delight. There were two pubs here for hundreds of years, the Red Rose and the White Rose, one at each end of the village, but in the early years of the 21st Century the White Rose closed. 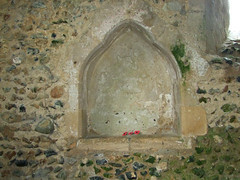 Not far from where it stood on the road to Kersey is St James' chapel. There was probably an inn here in the 13th Century when this was a chantry chapel to nearby Lindsey Castle. 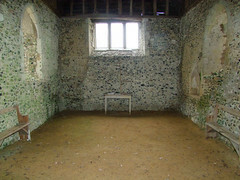 All that survives of the castle today is the traces of the motte and bailey earthworks, but this chapel survived the Reformation to become a barn, a use to which it was put for nearly 400 years. In 1930, the owner gave it to the nation, and it is now in the care of English Heritage, who, remarkably, do not charge an entrance fee. The chapel is hidden from the road by trees and hedges, although a view may be obtained across the garden of the adjacent cottage. You approach along a lane between high fences, and enter through the south door. 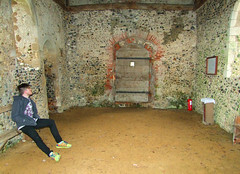 Inside, you find a bare, rectangular space, with an earth floor. 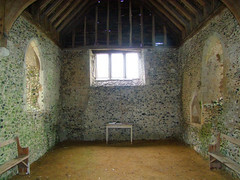 Much has been patched up over the years, but the lancet windows and piscina in the south wall show it to be original, probably mid-13th century. An ivy-covered cross was fixed to the east wall on the day I first visited, the Saturday before Easter 2001. I came back on Easter Monday 2015. So much had changed in my life, but little had changed here. The grill in the west door reminded me of the one at Badley. Corbels support the crossbeam of the roof; worn as they are, it doesn't take much imagination to make out faces on them. Once, so many churches must have been like this. The additions of chancel, tower and porches would convert it into the more familiar shape of a parish church. On a summer's day it is a glorious walk from here to St Peter, passing the donkeys on the corner, and buying duck eggs at the little stall. And after St Peter, it is a short walk on to the Red Rose public house for a pint or two, mourning the loss of the White Rose as we go. And then back here. Everybody's life should be open to such simple pleasures.